This article first appeared in The Edge Malaysia Weekly, on April 8, 2019 - April 14, 2019. REVENUE Group Bhd, the best performer among the newly listed companies on Bursa Malaysia last year, believes it needs to be more than just a payment solutions company in order to maintain its earnings as price competition is expected to intensify over the next three to five years. “We must do more than just be a payment solutions company. We expect the MDR (merchant discount rate) to go lower and lower in the future. The margin will be lower as transaction numbers go up. Then, there will also be other players joining in. So, we think that the price war will definitely happen in the next three to five years, whether it is in e-money, websites or services,” Eddie Ng Chee Siong, managing director and group CEO of Revenue Group, tells The Edge in an exclusive interview. A recent proposed acquisition of a 51% stake in Buymall Services Sdn Bhd by the group’s wholly-owned subsidiary, Revenue Harvest Sdn Bhd, for RM3.32 million is one of the measures that Ng believes will help the group stay competitive amid the anticipated price competition. Buymall operates an online marketplace and provides procurement services for consumer goods from overseas e-commerce websites as well as cross-border logistics and last-mile delivery for Malaysians. According to Ng, the acquisition of a stake in Buymall will open up a new segment for Revenue Group, with the target market being tourists from China who visit Malaysia. He says the Chinese tourists who come to Malaysia can buy duty-free and duty-paid items online and have them delivered to their hotels with Buymall’s services. “As we already have a connection with Chinese tourists via Alipay or UnionPay, we can easily market the website to these users when they come to Malaysia. That’s where Buymall also sees value in us. “Why would they (the tourists) purchase online in Malaysia? Firstly, they trust the products in Malaysia as there are a lot of counterfeit products in China. Another reason is that when they are here, they have limited time to shop. For example, they can only check in about two or three hours before their flight. After going through customs and immigration, they don’t have enough time to shop in the duty-free shops,” Ng says, adding that some of the duty-free merchants are also using Revenue Group’s terminals for payments. He, however, acknowledges that there are various compliance issues the group has to deal with when it comes to duty-free shops. Hence, it will take time for it to be involved in the duty-free shopping and delivery businesses. For its financial year ended Sept 30, 2018 (FY2018), Buymall recorded a profit after tax (PAT) of RM249,208. The acquisition will be satisfied via the issuance of shares in Revenue Group and comes with a guarantee of a minimum PAT of RM300,000 for FY2019 and RM500,000 for FY2020, with a combined PAT of not less than RM800,000 for FY2019 and FY2020. According to Ng, there is synergy between Buymall’s and the group’s businesses. The latter’s partners or merchants will have access to value-added services such as an online presence. “Some of our partners or merchants have a physical store and while they know how to sell to walk-in customers, they may not have the expertise to do so online. On the internet, you must know how to market yourself. Buymall already has these services in place. We can help our physical merchants develop an online presence,” Ng says, adding that the merchants that use the group’s payment solutions can also tap into Buymall’s delivery and warehouse storage services. On the growth potential of the new business, Ng says the group is targeting a revenue contribution of between 20% and 25%. In its first six months ended Dec 31, 2018 (1HFY2019), about 60% of its revenue was driven by the electronic data capture (EDC) terminals segment while 36.6% came from its electronic transaction processing segment, with the rest provided by the solutions and services segment. Apart from Buymall, Revenue Group has also proposed to acquire a 70% stake in Anypay Sdn Bhd for a total purchase consideration of RM4.9 million, which will also be satisfied via the issuance of shares. “With Anypay, we want to add another solution to the EDC terminal. So, what’s the business case like? If you walk into a convenience store such as 7-Eleven, you will see that this terminal can accept card and bill payments. Anypay is basically a bill payment gateway. You can top up your Maxis account, or even those of overseas telcos and IDD cards. All of these top-ups are inside Anypay. We take the Anypay application and put it inside the terminal,” Ng explains. Revenue Group sees this additional solution as helping to strengthen its competitive edge. 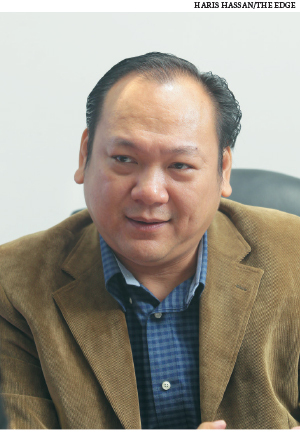 “This acquisition will help us to position ourselves against our competitors … we can provide the various solutions to our clients instead of having them turn to other players,” Ng remarks. It will also contribute to Revenue Group’s bottom line as Anypay will require electronic transaction processing services, which the group offers. For its financial year ended Aug 31, 2018 (FY2018), Anypay recorded a PAT of RM488,402. Under the conditional share sale agreement, there is a guarantee of a minimum PAT of RM500,000 for FY2019 and RM750,000 for FY2020, or a combined minimum PAT of not less than RM1.25 million for FY2019 and FY2020. On why the group opted to issue shares for the acquisition of the two companies despite its healthy balance sheet, Ng says cash is important to an information technology company, especially in the event any investment opportunity arises. “We would also prefer to use cash for our daily operations, such as the purchase of the terminals,” he adds. The acquisition via the issuance of shares also ensures the commitment of the management teams of Anypay and Buymall, Ng points out. The management of the two companies will be retained for the next three years at least. Revenue Group expects to maintain a double-digit growth in its top line over the next few years, he says. 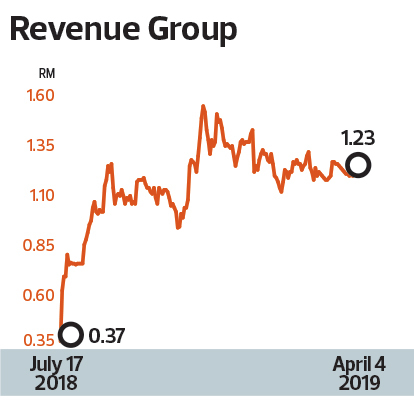 Revenue Group closed at RM1.23 last Thursday, giving it a market capitalisation of RM274.1 million.